Angell Pets excellent range of APL pet foods has now been extended to include a grain free range of premium dog food at great value prices. Dogs are carnivores but most dog food on the market contains at least some grain. The cheaper the food, generally the more grain it contains, to the point that some foods contain much more grain than meat. Whilst this would be good news for a human it is bad news for a dog. The grain is only there in most cases to provide a cheap filler to keep the price of the food down, not to benefit the dog. With some of the really bad foods, there is so little meat protein present that the grain (in this case wheat, the least desirable grain to use) is actually providing the bulk of the quoted protein content of the food (wheat gluten is a vegetable protein). Angell Pets have sold high quality, high meat content, grain free foods for years. These provide the optimum diet for your dog. 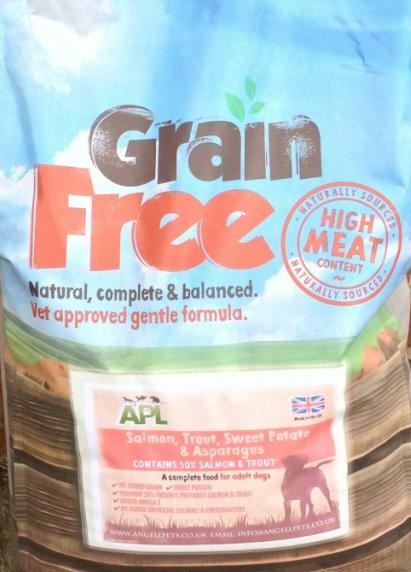 Although Angell Pets has been able to provide a grain free product of our own (APL Duck and Potato) for some time, we are pleased to launch our own APL Grain Free, high meat content dog food. The range so far includes APL Turkey, Sweet Potato and Cranberry, APL Salmon, Trout, Sweet Potato and Asparagus and APL Pork, Sweet Potato and Apple. Whilst we make no claim the ingredients are as fresh as say Orijen, we are satisfied that the meat content is now sufficiently high to offer this as a cheaper alternative to premium ranges such as Acana, Orijen and Canagan. In our view Orijen remains the best bagged dog food on the market but at this price ours is now a viable alternative. 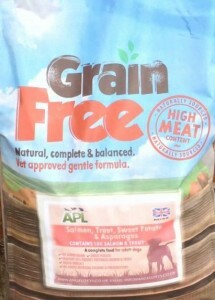 APL Grain Free Food is now avaialble in store or on line in 2kg and 12 kg bags. For more information call the shop, drop us a line or pop in a visit us at Angell Pets.